Beauty Under 10 | Beauty should only take 10 minutes WHAT ARE YOU FEEDING YOUR SKIN? If you want glowing, vibrant, and younger looking skin, make sure you're putting skin-friendly foods on your plate. Many people spend money on facials and skin creams, cleansers, and serums but are missing a key skin-saving piece. 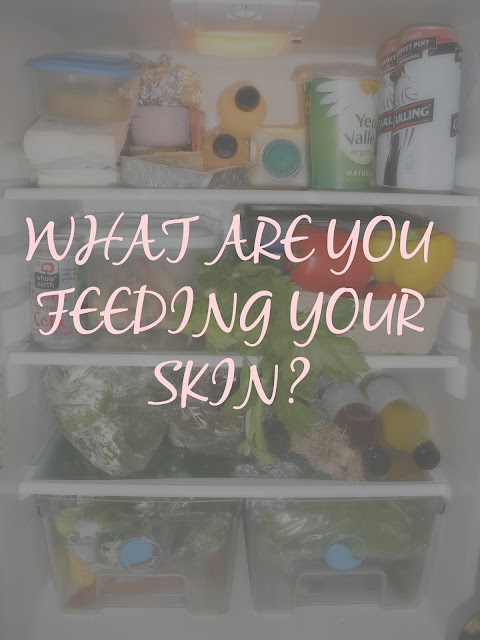 Health experts believe that when your diet is missing certain foods, other, even more serious skin problems can result. The less attention we pay to what goes in our mouth, the more problems we may see with our skin. Strawberries, blueberries and blackberries pack high amounts of antioxidants. Antioxidants help block "free radicals," such as the sun's rays, from damaging skin cells. Don't toss your sunscreen just yet. Eating berries is an extra step you can take to help protect your skin from damage and prevent premature aging. When you help protect the cells from damage and disintegration, you also guard against premature aging. These fruits may very well help keep your skin healthy looking longer. Vegetables such as sweet potatoes contain beta-carotene and vitamins A and C — a good formula for beautiful skin. These nutrients can help retain skin moisture and prevent dryness. Vitamin A is one of the most important components of skin health. One of the best places to get low-fat dairy is in products like yogurt. Experts say that the health of our skin cells is dependent on dietary vitamin A.
Low-fat yogurt is not only high in vitamin A, but also acidophilus, the "live" bacteria that is good for intestinal health. Anything that helps keep digestion normal, any live bacteria or enzymes, is also going to be reflected in healthy-looking skin. These foods seem unrelated but they all deliver essential fatty acids and are key foods for healthy skin. Essential fatty acids are responsible for healthy cell membranes, which will act as barriers to harmful things but also as the passageway for nutrients to cross in and out and for waste products to get in and out of the cell. That means plumper healthy skin. The best-known essential fatty acids are omega 3 and omega 6, which must be in balance for good health (and good skin). Though we all seem to get enough omega 6, many people lack omega 3s. Fish, walnut, and flax seed oil are some of the best sources. Oils can give your skin much needed moisture. Just make sure you're using healthy oils, such as olive oil. Adding just 2 tablespoons a day to your diet will help keep your skin properly lubricated and healthy. The mineral selenium is an antioxidant found in whole-grain products. Selenium can help control cell damage that can lead to skin cancer. Filling up on whole grains will help you avoid refined white flour and starchy foods that can increase your insulin levels. High insulin levels can induce inflammation and irritate your skin. This beverage deserves its own category for healthy skin. The skin-health properties in this beneficial drink just can't be beat. It has anti-inflammatory properties, and it's protective to the cell membrane. It may even help prevent or reduce the risk of skin cancer. Studies show that taken orally or applied to the skin, green tea can reduce the risk of damage from ultraviolet light (such as the burning rays of the sun), and reduce the risk of skin cancer. While the exact amount you should drink each day varies, no one disputes the role good hydration plays in keeping skin looking healthy and even young. When that hydration comes from pure, clean water; not liquids such as soda or even soup, experts say skin cells rejoice. The estimated amount of water the skin needs is at least eight glasses every day. In addition to keeping cells hydrated, water helps cells move nutrients in and toxins out, which automatically leaves skin looking better.